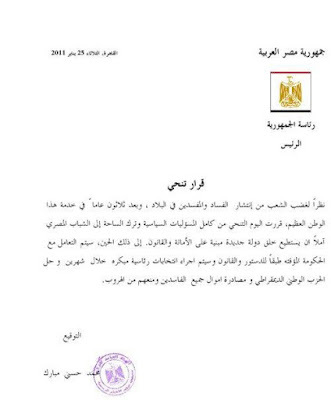 In 15th of January 2011, the Facebook page We All Khaled Saed posted a picture of a virtual decree by the Egyptian President Mubarak announcing stepping down after 30 years as a public servant (the post said the signature is only remaining and decree would be effective once people went into streets in Jan25). After Jan25, Facebook in Egypt got more buzz. Of course, many Egyptians after Jan25 adopted Facebook more rapidly including the Egyptian government itself.